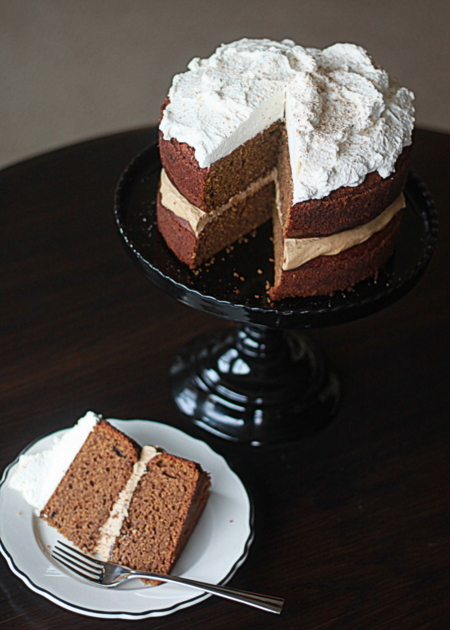 Inspired by Starbucks' cult-classic harbinger of fall itself - the pumpkin spice latte - this cake buzzes with two glorious layers of coffee-tinged pumpkin cake sandwiching an espresso cream cheese filling, and then it's topped off whipped cream and a sprinkling of nutmeg. My guy and I have recently recommitted to a healthier lifestyle. We’re getting older, we’ve got a daughter now, and it just sort of needs to be done. We’re eating less processed foods and more whole foods. We go out for walks every evening, and we’re talking about working towards taking part in a 5K come spring. 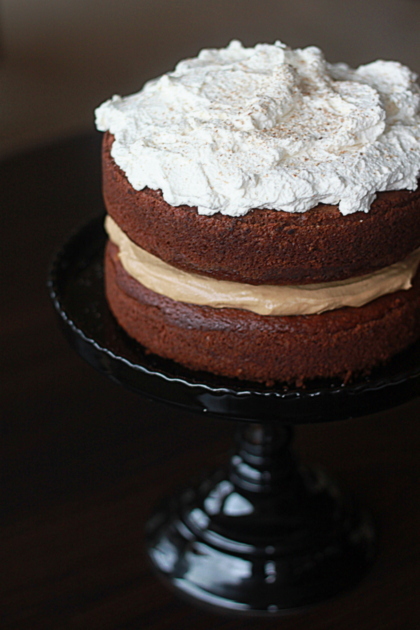 And we’re enjoying indulgences like this Pumpkin Spice Latte Layer Cake. Oh, you say. This must be one of those healthy desserts with pureed dates and coconut whipped cream, right? Heck no. It’s got pumpkin, it’s got eggs, it’s got sugar, oil, real whipping cream (and lots of it), and it certainly has a ton of white flour. Here’s the thing we know to be true: when you deny yourself something completely, 100%, cold turkey, it becomes harder and harder to resist. And then a diet becomes just that: a diet, a temporary way of being, something you do until you (hopefully) lose the extra poundage and then you go back to your old ways because you’ve denied yourself something completely. So we’re doing this whole thing in moderation. And we will have dessert on this journey to our healthier selves, yes we will. Not every day, mind you. We’ve picked one day a week – Sunday, to be exact – when we get to splurge on desserts like this cake, inspired by Starbucks’ cult-favorite harbinger of fall itself, the pumpkin spice latte. 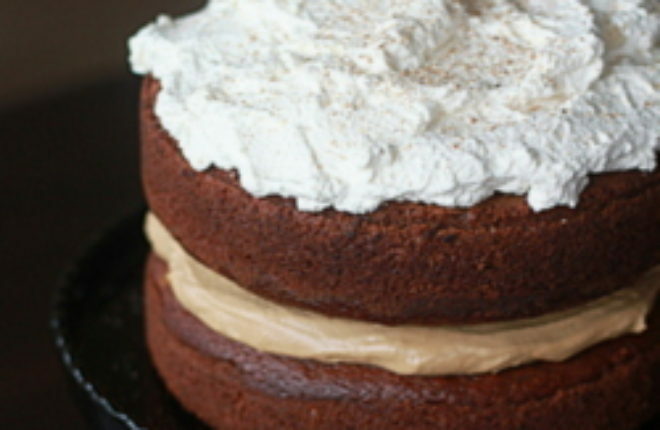 Two glorious plump layers of coffee-tinged pumpkin cake loaded with spices, sandwiching an espresso cream cheese filling, and topped off with an obscene amount of whipped cream and a little nutmeg. If we’re only going to do this thing once a week, we’re going to do it right. Yep, we’re going to have our cake and eat it too. You know I had to say it. Preheat oven to 350 degrees Fahrenheit. Position rack in the center of the oven. Butter two 8-inch cake pans and line the bottom with parchment paper. In a large bowl, sift together the flour, baking powder, baking soda, cinnamon, ginger, allspice, nutmeg, cloves, and salt. In the bowl of a stand mixer fixed with the paddle attachment, beat together the oil, granulated sugar, and dark brown sugar on low until blended. Add the eggs one at a time, beating well after each addition. Add the pumpkin puree, espresso powder, and vanilla extract and beat on medium until combined. With the mixer on low, slowly add the flour mixture to the wet ingredients, beating just until incorporated. Remove bowl from mixer and stir once or twice with a wooden spoon to ensure the batter is well-combined. Divide the batter between the two prepared cake pans. Smooth the tops with an offset spatula. Bake for about 35-40 minutes or until a toothpick inserted in the center of the cakes comes out clean. Place on wire racks and let cool for about 10 minutes. Carefully loosen the sides of the cake by running a butter knife around the edge of the pans. Invert the cakes onto wire racks and remove the parchment paper. Let cool completely. In a small bowl, stir together the instant espresso powder and the hot water until all the powder is dissolved. Let cool. In the bowl of a stand mixer with the whisk attachment, add the cream cheese, powdered sugar, whipped cream, vanilla extract, and espresso mixture. Beat on medium until smooth, thick, and forming soft peaks, about 1 minute. In the bowl of a stand mixer with the whisk attachment, add the whipping cream. Beat on low until the mixture begins to thicken, then increase speed to medium high. As the mixture thickens, add the vanilla and sugar. Continue beating until stiff peaks form, about 1 minute. Place one cake layer on a cake plate, right side up. 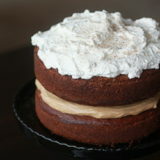 Scoop the espresso cream filling onto the top of the layer and, using a spoon, smooth to about 1/2 inch from the edge. Carefully place the second layer upside-down on top of the filling. 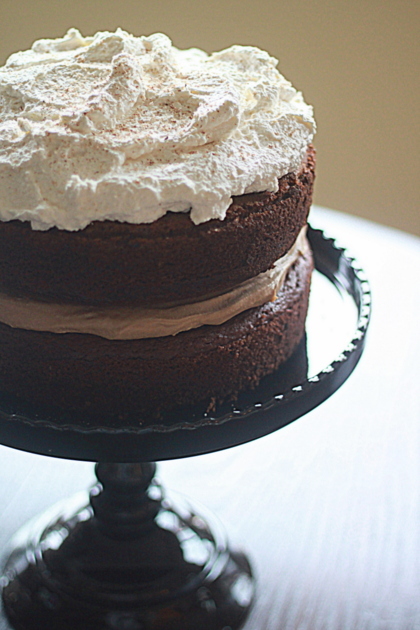 With a large spoon, pile the whipped cream on the top of the cake, covering the entire top of the cake. Serve within two hours; otherwise the cake should be refrigerated. Put my own twist on this recipe as I wanted a smaller version of this. I halved the recipe (only one layer) cut it in half an spread home made caramel sauce in the middle and of course topped with ample whip cream. Instant hit! ! So, when I made the filling, it came out runny on the first try. I had to add the rest of the cream cheese from the package and add more powdered sugar for the desired thickness needed. I may just decrease the amount of heavy whipping cream next time. Otherwise, it’s all coming together wonderfully! I do not have clove powder but have pumpkin spice. would that work as a substitute? If so, how much would I need to use? Pumpkin spice mix is usually made up of cinnamon, nutmeg, ginger, and nutmeg/cloves. So you will get some cloves in there for sure, though it won’t be quite the same! Maybe a teaspoon of pumpkin pie spice mix would do the trick. Pingback: MF Daily - What We’re Obsessed with this Week - Halloween!